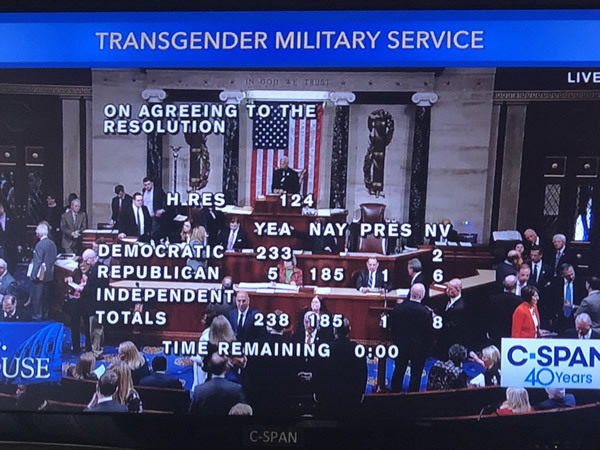 The U.S. House voted March 28 to rebuke President Trump’s transgender military ban by approving a non-binding resolution with bipartisan support. The resolution, which was introduced by Rep. Joseph Kennedy III (D-Mass. ), was approved by a vote of 238-185 after an hour of debate on the House floor in which lawmakers denounced the Trump administration’s policy as discriminatory. On the House floor, Kennedy said his resolution reinforces the American idea that “equal has always been our nation’s North Star” despite a history that has included slavery and racial segregation. 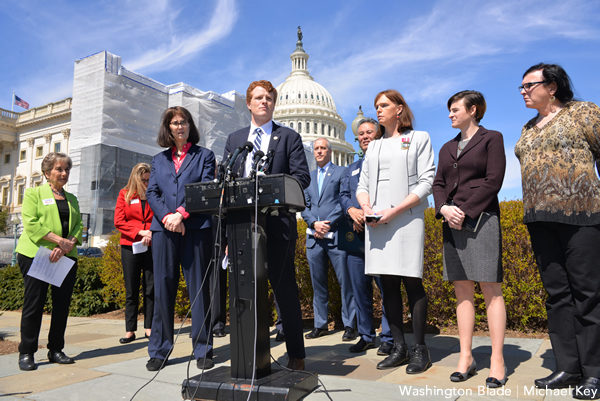 “Today, this House has a chance to not repeat the mistakes of our past, to move one step closer to that sacred promise, by telling brave trans men and women in uniform that they cannot be banned from military service because of who they are,” Kennedy said. Five Republicans voted for the resolution against the transgender military ban: Reps. Will Hurd (Texas), John Katko (N.Y.), Trey Hollingsworth (Indiana), Brian Fitzpatrick (Pa) and Tom Reed (N.Y.). Another Republican — Rep. Justin Amash (Mich.) — voted present. The House approves the resolution shortly after the Defense Department unveiled its plan to begin the transgender military ban on April 12. Although federal courts had initially blocked the administration from enacting the policy, the orders were lifted in accordance with guidance from the U.S. Supreme Court effectively green-lighting the ban as litigation proceeds against it. Also speaking out in favor of the resolution was House Majority Leader Steny Hoyer (D-Md. ), who last week announced he would bring the measure to a House floor vote. Rep. Adam Smith (D-Wash.), top Democrat on the House Armed Services Committee, said before that tweet “there was no problem” allowing openly transgender people in the military — a practice that started during the final year of the Obama administration. “He sent out a tweet saying we should ban transgender people from the military, and the military has had to backfill that tweet with a policy, and I feel bad for members of the military who have had to do that, who have to waste their time for the last year trying to accommodate the ignorance and bigotry of this presidential policy,” Smith said. The number of lawmakers — all Democrats — who spoke out on the House floor in favor of the resolution by far exceeded the two lawmakers — both Republicans — who spoke out against it. Among them was Rep. Vicky Hartlzer (R-Mo. ), who has a notoriously anti-LGBT record and two years ago introduced an amendment to the House floor seeking to ban the U.S. military from paying for transition-related care, including gender reassignment surgery. Even though Republicans at the time controlled the House, lawmakers voted down the amendment. Rep. Mac Thornberry (R-Texas), chair of the House Armed Services Committee, said lawmakers were “rather consumed by presidential tweets” and urged fellow House members to remember the six-month-long study that began at the time of Trump’s tweets and resulted in the transgender military policy. Chair of the Joint Chiefs of Staff Gen. Joseph Dunford — who said on transgender service anyone who meets the standards of service should be able to serve — spoke about the process that led to the current policy. According to numbers first reported by USA Today and verified by the Pentagon, the U.S. military since 2016 has spent nearly $8 million for transition-related care for 1,500 transgender troops, which includes 161 surgical procedures. That’s a small fraction of the Pentagon’s annual budget of around $600 billion. During testimony last month before Congress, five transgender service members said the time they needed to transition during service was minimal and took as little as a few weeks. Many said they transitioned on vacation or personal time. The non-binding resolution approved by the House doesn’t have the force for legislation. Rep. Jackie Speier (D-Calif.) and Sen. Kirsten Gillibrand (D-N.Y.) have introduced bills in their respective chambers of Congress that would bar the U.S. military from discharging qualified individuals on the basis of transgender status. Speier has said she’d seek to amend the annual defense authorization bill with her measure.